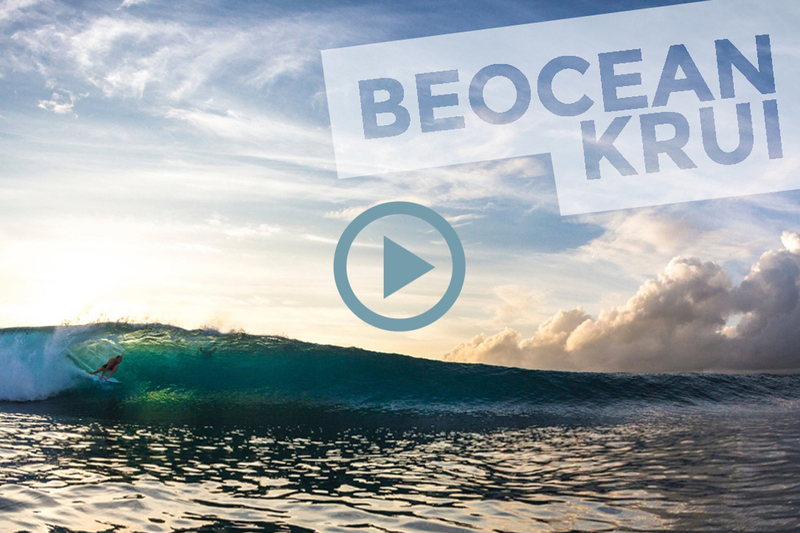 "BeOcean overlooks a perfect left & an equally hollow right. Its also located in the middle of the surf region, giving you the best possible access to Lampungs other waves"
"BeOcean is a stylish new ocean front camp on the outskirts of Krui. Come and enjoy perfect surf, delicious food as well as its warm and welcoming ambience..."
BeOcean has fast become one of the biggest head turners in the whole region. It’s stylish yet homey feel offers an incredibly warm and happy vibe thanks to the attention to detail that its owners (Alicia & Max) have put in. Just like its accommodation, the food menu is top notch with some of the healthiest dishes you’ll experience in the whole of Sumatra. Perfectly situated in front of a left hander (Leftovers) and a right hander (The Peak), guests can surf all day long as well as take in the breath taking views of the distant Sumatran Mountains. Guests can arrive or depart anytime or any day (min 6 days stay). Local transport is also available at a small charge; to give you access to the regions other waves. Ideal for the health conscious, travelling couples or families or just about anyone! The quality of the bungalows on offer at BeOcean is a reflection of the time and effort that has gone into creating this little slice of paradise. Rendered walls, tiled roofs & polished concrete floors create a sleek finish & the quality fixtures and fittings add the perfect finishing touch. Those concerned about the tropical heat will be grateful of its high ceilings & cleverly designed windows that allow maximum breeze (and light) throughout the day. There are also plenty of fans in each room. All bungalows come complete with comfy spring beds (queen or single 'king' size), high quality mosquito nets as well as plenty of storage space inside & out. Each room is fully lockable & has its own veranda. Although safe, there is also 24 hour security within the camp. There’s a large focus on healthy eating at BeOcean. Alicia & Max are very health conscious and so expect great food during your stay. They clearly understand the important role food plays for their surfing guests. BeOceans meals are also plentiful & varied each day with a mix of Indonesian, Mediterranean & western dishes. Vegetarians & vegans are easily catered for as well as specific dietary requirements given prior notice to your arrival. BeOcean's main building serves as the largest social area and includes a lounge & TV as well as the camps dining area where each meal is served. It’s large and spacious and is beautifully decorated and always seems to have a welcoming ambiance. You can also find the main reception here, where guests can also order a freshly squeezed juice or tasty snack. Any guest staying at BeOcean will fall instantly in love with the ocean front covered deck area. For the surf hungry, kick back, relax and wait for the perfect time to head out, as BeOcean overlooks two of the region’s best waves. Those wanting to loosen up in between surfs, will find no better place to grab a yoga mat and stretch out that muscle fatigue from a hard days surfing. For the non surfing guests, there’s simply no better spot to recline into a hammock, read a book or watch the world go by. It’s also a favourite hang out to simply enjoy a cold Bintang and to take in one of Sumatra’s incredible sunsets. Brand new in February 2019, guests can unwind at BeOcean's impressive infinity swimming pool (7.5m x 4.5m) that directly overlooks the surf. Next to the pool is a small additional deck area (2.5m x 1.5m) for guests to relax in. Alicia & Max will always be on hand so you can enjoy and discover this amazing region and help surfers to find the various breaks that are spread across the region. Daily transport isn’t included in the price but is always available on arrival. The surf region stretches around 50 miles and is accessed by a long twisting road that takes about 1.5 hours to reach all the surf breaks. Motor Bikes with surfboard rack are typically around $5 / day depending on availability and length of rental. Car hire with driver is usually around $40 / day. But of course pricing can vary from driver to driver. Please note fuel will be additional but is relatively cheap in the region. For those looking to explore the region other than surfing, you’ll be pleased to learn that despite the areas remoteness there are still some activities & day trips to check out. - Snorkelling is easily available out the front of BeOcean or other nearby spots. - When the swell is smaller, Stand Up Paddleboard's (SUP’s) are also available for all the guests of BeOcean to enjoy. And thanks to its ocean front location it’s easy to venture out from the surf camps shores. Pricing is IDR 100,000 (approx AUD 10) / 2hrs. - Any keen fishermen staying at the camp will be pleased to hear that there's a number of good local fishing spots. Rest assured that you're in good hands as Max is very experienced especially when it comes to spear fishing. Bring your own gear although there is some equipment available at the camp. - Banana Island (Pulau Pisang) which is directly opposite BeOcean, is a must visit location during your stay in Krui. Accessed by a short boat ride, it has 2 waves either side of the island as well as being a great spear fishing and snorkelling spot thanks to its translucent waters. Other activities include jungle trekking inside the national park of Bukit Selatan, visiting one of the regions waterfalls or a day trip to Lake Ranau. Many of these activities can be done on your own although we can easily organise them for you if you prefer once you arrive at BeOcean. For those looking to simply unwind at the camp, guests can also grab a massage (anytime) without having to go anywhere! BeOcean have stepped up their game once again in 2019 and will have yoga classes available each day for their guests. For guests planning on visiting October onwards, yoga classes will be subject to availability so please contact us before booking. Guests staying at BeOcean will have direct access to the half a dozen or so waves in the town of Krui. These are all within a 5 minute motorbike ride. Although the waves are typically a little smaller than the more exposed reefs like Ujung Bocur (30 mins to the south), guests can expect super fun surf in the head high region between April to September. As soon as you've checked in, you're free to surf! And when you're keen to explore the rest of the region, grab a motor bike (approx $5/day with rack) & Alicia and Max (the resort owners) will direct you to the regions other surf spots. Detailed information for all the surf breaks can be found in the destination's section of the site within the Krui, South Sumatra pages. Please note: We don't advise taking the bus as it’s a longer journey, only runs at set times, is uncomfortable and generally only gets you within 45 mins of where the camps are located. There is also a flight service from TKG to Krui - but at the moment is proving unreliable and tricky when taking surfboards. Upon arrival at Bandar Lampung (TKG) Radin Inten II Airport, guests will be greeted by one of our staff members with pre-arranged transport and you'll be taken to direct to the camp. The transfer time is about 6 hours which includes a brief stop to grab some food half way through the journey. Vehicles are usually a Toyota Kijang and we keep the maximum passengers to 4 so there’s plenty of room for a comfortable journey and enough space for all your belongings. Guests usually don’t stay in Bandar Lampung as there’s generally no need to. We can always collect you and drop you off any time to/from the airport. However we suggest staying at either of the following options if our guests prefer to overnight in the city. Important: Make sure to check our "know before you go" section which is a handy page of what to expect as well as a detailed inventory of travel essentials. Note: Airport transfers" are paid on arrival in IDR. Details will be emailed upon booking. Note: Guests have the option to settle their bill by credit card for beers, massages & motorbikes etc during their stay. By way of payment guests are agreeing to both BeOcean Surf Camp & Surf Camp Sumatra's Terms & Conditions. ‍Perfect location between the areas best waves with a little bonus wave right out the front. Camp set up is deluxe, you couldn't expect more. Max and Alycia are onto it and its obvious they have a hospitality background. The food is restaurant grade and different everyday. ‍Well what a great time we had at BeOcean Krui.... Max and Alicia were amazing host! I was extremely impressed with the food. the bungalows were clean and cosy... I highly recommend staying here if you are looking for accomodation in the Krui area. We'll be back! ‍Staying at BeOcean during my Sumatran surf trip contributed to this being the best surf trip I've done. The location was perfect with a handful of different reef breaks right out the front, a sand bank beachie 15 mins scooter away, many more other reef breaks in within an hours drive in both directions and also a bonus island wave 1 hr off the coast by boat. The natural wooden bungalows were much more luxurious than I had anticipated and allowed me to recuperate in comfort after consistently doing over 6hrs in the water each day. The common areas have all been designed with thought and intention to create more than just a place to stay, there is strongly relaxing vibe about the place. The other guests seemed to agree on this and most evenings ended with a group beer on the deck watching the sunset and the last few waves roll over the reef for the day. Our three meals a day were top restaurant quality and appropriately portioned to fill up hungry surfers. The smoothies and jaffles on request were also a big hit amongst everyone and ensured nobody was ever forced to leave the accommodation to get food. Max and Alicia, along with their excellent and friendly team of staff, worked very hard to ensure that myself and all other guests were provided with the optimal experience during our stay at BeOcean. I will 100% be returning to BeOcean for another stay, my only hope is that it is sooner rather than later! Great spot! Great People! Great Food! ‍We couldnt be happier about choosing BeOcean for our 12 days in Sumatra. Max, Alicia and all their staff were super friendly and were always on hand to help with anything. The location was excellent with several fun reef breaks within walking distance and many more within a short scooter ride. The accommodation and facilities were excellent. Beautiful and comfortable bungalows and the common areas were the perfect place to relax after surfing all day. The food was delicious and had a good variety of western and Indonesian food and I was always happy with the meal sizes. Max was very knowledgeable of the surf conditions, each time we went to explore either by boat, car or scooter we were always greeted by excellent waves. Max even joined us for a few surfs which was great and he also takes amazing photos!! Thanks again for having us and already looking forward to our next trip!